Mémoires en jeu | “Enough is enough”: Why and how a Belgian village decided to stop commemorating a massacre from World War One – or did it? Y a-t-il un moment où il vaut mieux cesser de commémorer ? Il y a deux ans, j’ai appris qu’un village en Belgique, dont la population avait été massacrée par l’armée allemande en août 1914, avait récemment décidé de supprimer la commémoration annuelle de ce massacre. Cela me semblait inhabituel, voire spectaculaire. Je connaissais des communautés qui ne voulaient pas commémorer des actes de violence parce que leur majorité avait été du côté des bourreaux. Je connaissais des survivants de violence de masse qui préféraient ne pas se souvenir de ce qui leur était arrivé ou qui se voyaient refuser la possibilité de le faire. Je connaissais des lieux de mémoire tombés dans l’oubli, ou des commémorations abandonnées après un changement de régime politique. Mais je n’avais encore jamais entendu parler auparavant d’une communauté qui avait été victime d’un massacre, qui commémorait régulièrement et pendant des décennies ce massacre, et puis un jour, sans que la situation politique n’ait changé, avait décidé délibérément d’arrêter cette commémoration annuelle. J’ai donc décidé d’enquêter sur ce cas. Le présent article raconte l’histoire de cette enquête qui me mena au village de Spontin, dans la province de Namur en Belgique, où je rencontrai différents protagonistes du village et de ses environs. Mon travail de recherche se transforma en enquête à rebondissements ; chaque réponse souleva de nouvelles questions, et plus j’approfondissais le sujet, plus je parlais avec différents interlocuteurs, plus l’affaire semblait devenir énigmatique: Y avait-il vraiment eu une décision d’arrêter la commémoration annuelle ? Et si oui, par qui et comment cette décision avait-elle été prise ? Au-delà du cas de Spontin, ce texte pose des questions plus générales : Dans quelles circonstances cela fait-il sens d’arrêter ou de poursuivre une tradition commémorative ? Quels sont les moyens appropriés pour entretenir et garder vivant le souvenir d’événements douloureux ? Qui est légitime pour décider de ces questions ? Le texte est enfin aussi une réflexion sur ma propre relation, en tant qu’historien, au thème de la mémoire, sur mes propres attentes et approches quant à mon sujet de recherche, et sur mon rôle en tant que chercheur débarquant dans une communauté villageoise qui lui est inconnue. The information did not immediately attract my attention. In Spring 2016, I was in the Belgian town of Dinant for research about the annual commemorations of the massacre committed in this town on August 23rd, 1914, by German troops against the local civilian population. While interviewing an inhabitant of Dinant, he noted: “Perhaps it would be better to do it like the village of Spontin; they also had a massacre in August 1914, but decided in 2014 that this would be their last official commemoration.” I had only vaguely heard about Spontin before, a village not very far from Dinant, and knew nothing about such a decision. One day later, another interviewee also mentioned Spontin’s decision, and further noted that the mayor of Dinant had publicly declared that his town would not follow in suit: unlike Spontin, Dinant would continue with its annual commemoration after the Centenary of 2014. And then the information started to sink in: There was a local community which had deliberately decided to stop commemorating the massacre its inhabitants had been victims of. This sounded unusual, even spectacular. I knew about communities who did not or do not want to commemorate acts of violence because their majority had been on “the perpetrator-side”. I knew about survivors of mass-violence who preferred not to remember what had happened to them or who were denied possibilities to commemorate this. I knew about memory sites which had passed into oblivion, or commemorations which had been abandoned after a political regime-change. But I had never before heard of a community which had been the victim of a massacre, and which had regularly, over decades, commemorated this massacre, and then one day, without any change in the political situation, decided to stop this annual commemoration. And suddenly I became very interested in Spontin and its “cessation of commemoration”. Not only because it sounded so unusual, but also because it resonated with so many things I was experiencing in my work in Bosnia and Herzegovina, where memories about the 1992-1995-war, but also about the Second World War, were all over the place. Many people in Bosnia and Herzegovina have the impression to be stuck in the past, and it seems that the problem there is often not so much not enough memory, but rather too much memory. I experienced this in Bosnia and Herzegovina, but also elsewhere: with the strong development of transitional-justice-movements over the last two decades, there seems to be an explosion of memories in many societies – to such an extent that some experts and journalists are now again advocating for more forgettingin post-war-societies. Also in the field of scientific research there had been an on-going “memory boom”, with a multitude of articles and books on memory-related questions, in which I have been participating now for several years, and where I have increasingly the impression that the same topics and questions are discussed again and again. In short, I was just witnessing a sort of “memory-overkill”, in many of our societies, and in academic research, and also partially in myself. This story about Spontin therefore resonated with own experiences, observations, and feelings, and I definitely wanted to explore this case and then eventually also publish a text about it. I even already had a title in mind which sounded like a perfect summary: “Enough is enough”. And I imagined that this could be my last memory-related-article: Couldn’t there be a better way for me to get out of all this memory research and to focus again more on other topics? So I decided to delve deeper. I first began researching Spontin via the Internet. On August 23rd, 1914, during Germany’s invasion of Belgium at the beginning of World War One, German troops committed a massacre of civilians in Spontin. It happened the same day as the massacre in Dinant, which is located just 30 km away. In Spontin, German troops first executed the mayor and the priest, then more than 25 other inhabitants, and set the village on fire. Following this, around 120 predominantly male inhabitants were taken as prisoners to other villages, where 15 of them were also executed. All together, German troops killed 46 of Spontin’s 600 inhabitants during the massacre. The fire destroyed 131 of the 161 buildings in the village – including the church. The village was rebuilt in the following years, and after the war a monument erected to the killed inhabitants. 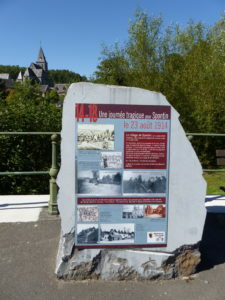 The memory of the massacre and the destruction of the village, as in other Belgian towns which had experienced a similar fate, was upheld through monuments and annual commemorations until 1939 and then again since the end of the Second World War. In 2014, for the Centenary of the First World War, as in Belgium in general, the commemorative activities had been outstanding in Spontin around August 23rd: Several exhibitions, a new monument, a book-launching, a remembrance march, various activities with school children, an official ceremony with discourses at the monument to the killed (which, for the first time, included the participation of a representative of the German Embassy), and the whole topped by an important sound and light-show in the center of the village which featured testimonies by survivors from 1914 read by inhabitants from today. I had found several articles on the internet related to this comprehensive 2014-commemoration, but here came my first surprise: there was absolutely no word about a decision that Spontin had decided to stop commemorating the massacre after the Centenary. So was the talk about the cessation of the annual commemoration just a hoax? At the same time, I didn’t find any article on internet about a ceremony which would have taken place in Spontin around August 23rd, 2015, the first year after the Centenary – what seemed to confirm that, after the 100-year-commemoration in 2014, the practice of the annual commemoration had indeed been stopped. Whom to ask to bring more light into this? 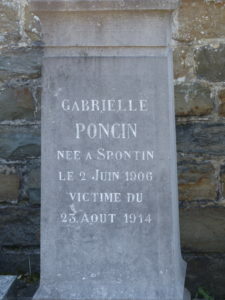 A colleague from Dinant told me the best would be to contact Jean Germain – “the local historian of Spontin”. I decided that I would go to Spontin the next time I would be in Dinant and to ask Jean Germain if I could meet him there. Before doing so I ordered the book he had published in 2014, in the framework of the Centenary, about the 1914-massacre, Spontin, de sang et de feu(“Spontin, blood and fire”). In this book I found a first written trace of the decision to stop commemorating the massacre. The books starts with a text entitled “Open letter from the afterlife as a preface”, signed by “Your former mayor, your former priest, your grand-parents, your ancestors, your fellow citizens”. It is a fictive text where the killed from 1914 speak, one hundred years “after our cruel death”, to the current inhabitants of Spontin. In two and half pages, the dead recall the events from 1914, express their satisfaction that Spontin and Europe are today living in peace and prosperity, as well as their gratitude that they have never been forgotten during the last 100 years. And then there is this sentence: “You are right not to continue with the annual commemorations.” So, yes, there obviously had been a decision to stop the annual commemorations in Spontin after 2014. What a relief – my article was saved. Even if it remained quite mysterious why I had found nothing about it on internet, and that the only written trace I had found so far about it was within a fictive text. Who had taken this decision? When? Why? And how had people reacted to it? In the meantime, in August 2016 I was on my way to Dinant to attend the annual massacre-commemoration. I had written to Jean Germain, and we had agreed to meet in Spontin, in front of the monument. On the morning of the August 23rd, 2016, the day of the 102th anniversary of the massacre, I drove from Dinant to Spontin. There I discovered a very nice village, with a medieval castle, and the church on a small hill in the center. I found two monuments next to each other, on the main street soon after entering into the village, just next to the castle. The older and bigger monument, dating from the 1920s, featured a cross and the names of the victims. And the new one, which had been inaugurated in 2014, offered photos and texts about what had happened in 1914. No flower-wreaths were laying around the monument(s). I saw then a car stopping, and I met Jean Germain and also his wife, Françoise Germain, who both are in their mid-sixties, and who greeted me warmly. Jean Germain and his wife first talked to me about the new monument and the big commemorations of 2014. The new monument had been added in 2014 because the original monument didn’t provide any information, only a list of names of the killed, under the title “Martyrs of August 23rd, 1914”. According to Jean Germain, “More and more people, and not only tourists, asked ‘But what happened?’” Because of this lack of knowledge, Jean Germain also had written and published his book, which provides a lot of information about the events from 1914, their context and their aftermath, and which he wanted accessible for a larger public (the book was therefore sold for only 5 Euro in Spontin in 2014). Then Jean and Françoise Germain told me more about the activities during the Centenary, especially those with the school children, where Françoise Germain, a former school teacher, had been very actively involved. The school children of Spontin had been working on the biographies of the victims and then had brought flowers and short poems to their graves in the cemetery. They also spoke with me about the sound and light-show where survivor-testimonies had been read by inhabitants of today. This sound and light-show, as the entire 2014-commemoration, said Jean Germain, had been “an important moment of awareness-raising, especially also for the many new inhabitants of Spontin who most of the time didn’t know what had happened in 1914.” The reactions to this sound and light-show had been so positive that they repeated it two months later. The book, the new monument, the sound and light-show, the exhibitions, and the various other activities on the 22nd, 23rd and 24th August 2014, all belonged together. According to Germain, “We wanted to commemorate in a significant way in 2014 and to leave a trace.” Jean Germain has been a key person in the organization of the Centenary, and in this context it is important to know that he is also president of two local associations which are closely inter-connected: one is called Le Patrimoine de Spontin(“Patrimony/heritage of Spontin”), which is taking care of historical sites in Spontin, and the other La mémoire de Spontin(“The memory of Spontin”), which aims to disseminate knowledge about the historical and cultural heritage of the village. But how did the decision to stop the commemorations after 2014 come about? When I asked this question, Jean Germain and his wife first talked to me more about the situation before 2014. In general the concrete knowledge about the events of 1914 had become weaker and weaker in the decades after World War Two; it was talked about in elementary school, and there was the annual commemoration, but this was basically it. Also many of the survivors did not talk about it in their families – Jean Germain himself remembers that his parents, who had survived the massacre as children, had never talked to him about it. With the years, many new inhabitants moved to Spontin who were not directly connected with the local history. In this context, the memory of the 1914-massacre had become more and more diluted, and the annual commemoration more and more a formality. Before 2014, the annual commemoration was typically organized on one of the Sundays after August 23rd, starting with the mass in the church, and then after the mass took place a procession until the monument to the dead, with laying down a wreath and lecture of the names of the victims. In the decades after the Second World War, the annual commemoration was mainly upheld by survivors of 1914, and also by war veterans from the Second World War. But as more the time advanced, more of these survivors disappeared, and the procession after the mass was carried out with only very few people participating in it. Jean Germain then remembers a conversation with the local priest, Bernard van Vynckt, around 2012, where they discussed the question of whether it made sense to continue with these annual commemorations, also considering that there is the annual commemoration of November 11, related to the end of the war 1918, where the killed from August 1914 are also remembered. So what to do with the annual August 23rd-commemoration? This discussion took place while there was already the perspective of the Centenary of the start of the First World War in 2014, and which would also be 100th anniversary of the massacre. Jean Germain spoke with friends and colleagues about the question, and he came to the conclusion that it would be important to “make something relevant and meaningful in 2014 in order to perpetuate the memory. We wanted in 2014 to create things which could last: the new monument with the explanations, the book… This seemed more important to us rather than to uphold a conventional annual commemoration which had lost its meaning.” Jean Germain continued, “But we had no power. 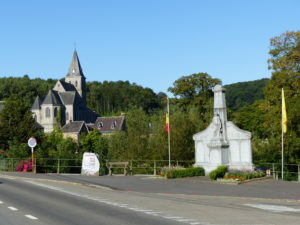 If the municipality had decided differently, it would have been different.” Here it is important to know that Spontin, since an administrative reform in Belgium in the 1970s, is not a municipality on its own any longer, with its own mayor and administration; instead, it became one of the eight communes of Yvoir in 1976. If the municipality of Yvoir was actively involved in the commemorations of 2014, it seems that it didn’t otherwise show much interest for the annual commemorations in Spontin (except for jubilee anniversaries, as also in 2004) which were basically carried out by the local priest and some local families. In short, I got the impression that Yvoir – which did not experience a similar fate as Spontin and Dinant in 1914 – seems in general rather far away for and from the inhabitants of Spontin. “Nobody reacted when I made, one or two years before 2014, the proposal to not continue with the annual commemorations after the Centenary”, Jean Germain went on to say. At that time, Germain was also the coordinator within the organization committee for the Centenary, a mixed committee organized around the association Le patrimoine de Spontin he presided over, and which gathered other local associations from Spontin, as well as the delegate of the municipality of Yvoir who is in charge of “patriotic associations and ceremonies”. This committee set up the program for the 2014-commemorations. Was the decision not to continue after 2014 taken within this commission? “There was no formal decision about that”, replied to me Jean Germain. Jean and Françoise Germain are leaving. I sit down, and try to summarize the main findings, my first preliminary conclusions. Firstly, when listening to Jean Germain, it is obvious that the reason to stop the annual commemorations was not “We are fed up with memory”, but “We have to find other ways to transmit the memory”, linked to the interrogation what would be, instead of of a ritualized procession with very few people, more appropriate means to honor the dead and to keep alive the memory of the events from 1914. Secondly, there obviously had been a decision to stop the usual annual commemoration, proposed by Jean Germain, who had and has an important social status within Spontin. But the decision-making-process nevertheless remained a bit mysterious to me: What did Jean Germain actually mean more concretely when he said that there had been “no formal decision” within the organization committee? And if there had been no formal decision within the organization committee, does this exclude that there has been a decision on another level? Thirdly, the decision to stop the annual commemoration cannot be thought outside of the context of the Centenary. The decision had been combined with a big last commemoration, what does not mean that the Centenary had been organized in order to finish the annual commemorations, but that it provided an opportunity to do so – to “finish on a high note” in a certain way and, with and through the Centenary, to provide means to continue the memorialization differently. And fourthly, the decision seemed to have been well accepted and it seemed that there had been no negative reactions, at least not openly formulated towards Jean Germain. All together, these mini-interviews suggested that actually there had been no unanimity regarding the decision to stop the annual commemorations. Older persons who had a family-history linked to August 1914 seemed more attached to the ritual than younger persons and inhabitants who had no personal connection (and who probably moved later to Spontin). But a stronger differentiation here would certainly be necessary: Jean Germain himself, who is in favour of not continuing, did lose his great grandmother and other relatives in August 1914, and Marcel Poncin didn’t criticize the cancellation of the annual procession, but was missing some commemorative expression around the monument. Having lost family members did therefore not necessarily mean one was critical about the decision. Also, two of the three critical persons expressed comprehension for the decision not to continue: “Who should take care of this annual commemoration?” One of the persons suggested to make a public call in order to look for persons in charge, but did obviously not think to be more proactive herself in organizing something. The lack of interest and/or of personal connections to August 23rdamong the population of Spontin seemed also to be confirmed by the fact that except for the flowers on the grave of the Poncin-family, I saw no other fresh flowers in the cemetery of Spontin. Furthermore, also among the critical persons I had interviewed, obviously no one had had the idea to lay down some flowers by their own initiative in front of the monument. Another observation emerged from the conversations with the persons I had randomly met. Most of the persons I talked to showed some interest in the topic of 1914 and its memory, and seemed also know about the decision to stop with the annual commemorations. Only one of them was not sure about it: When I asked her “Has there been a decision not to continue?”, she hesitated and answered “Perhaps”. But also the others did not seem to really know who had taken the decision, as appears the most explicitly in Marcel Poncin’s quoted remark. Similarly, one of the women met in the center of the village said to me: “I don’t know why theyhave taken the decision” – but she wasn’t explicit who were these “they”. Concerning the decision to stop with the annual commemoration, he further specified: “I don’t know if it was him [Jean Germain] or someone from the town who announced it officially. I did not participate in the decision, but in the debate. (…) But I know that the following year, in 2015, we kept the celebration of the Mass near the August 23rdin honor of the victims of these days of massacre. It was still very strong, but more ‘anonymous’, if I may say so.” In 2015, after the mass, some went also to the monument, but “only in a personal capacity and those who keep the will to honor one of theirs. It was not an official event anymore.” He then noted that he had since been appointed priest outside of Spontin, so did not know what had happened in 2016. Bernard van Vynckt’s email provided me with instructive additional information especially about the municipality of Yvoir, which seemed to have a more active role than I had thought. On the one hand, the municipality of Yvoir had already been present in the annual commemorations before 2014—not as an instigator of these annual commemorations, but mainly by sending a representative. On the other hand, concerning the cessation of the annual commemoration after 2014, it seemed that the municipality had actually been quite actively involved in the entire debate, and then also possibly in the decision-making-process. But also Bernard van Vynckt could not really say who took the decision. Additionally, his email illustrated that the decision not to continue with the annual commemoration had been carried out. Not in the sense that nothing was happening anymore after 2014, but now only on a private basis. In the months after I had other commitments, and didn’t follow-up with my research. 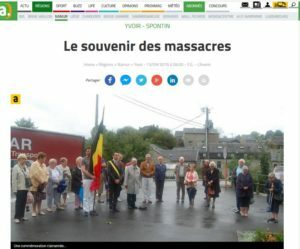 Then, one day in early 2017, I decided to google again “Spontin”, and then came a big surprise: I found an article from the local Yvoir-newspaper, L’avenir, from September 13th, 2016, with the title: “The remembrance of the massacre”, and which told that beginning of September a commemoration related to the 1914-massacre had taken place in Spontin. What? Who? How? Why? 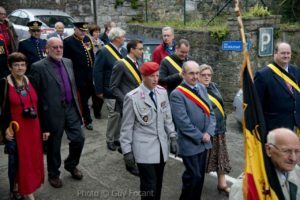 The text said that the delegate of the town of Yvoir for patriotic ceremonies and associations, Bertrand Custinne, spoke during this commemoration, and that it was also attended by a municipal councilor, Patrick Evrard. A photo illustrating the article showed around 20, mostly elderly, persons standing nearby the monument, one wearing the Belgian sash around his neck, obviously the delegate of Yvoir, and next to him a younger man holding the Belgian flag. The topic had already intrigued me, now it intrigued me even more. Despite the decision not to commemorate anymore, a public event had obviously taken place in 2016. So had the decision not to commemorate been revoked by the municipality of Yvoir? The article didn’t mention anything about this. The first sentence of the article was: “Fewer people than usual for the anniversary of the massacres of August 23rd, 1914, celebrated a few days after the date.” That sounded as if the annual commemorations actually had never stopped, at least in the eyes of the journalist. Perhaps this journalist was unaware of this decision not to continue? In order to get more clarification, the next time I was in Belgium I returned to Spontin. I had contacted Patrick Evrard, the municipal councilor mentioned in the article, who was living in Spontin and who agreed to meet me. He told me first about the commemoration from the previous September, which he had heard about by coincidence. While attending mass on the second Sunday of September, he heard that there would be the commemoration at the monument after the mass, and so he spontaneously joined the commemoration there. There had been no official announcement about this commemoration. As it turns out, an older inhabitant of Spontin, Léo Couturier, had organized this commemoration. He had been against the idea to stop the annual commemoration, and had also contacted the Yvoir-delegate for patriotic associations who then had agreed to come. So this commemoration could not really be called an official one: in the words of Patrick Evrard it was more “halfway between official and unofficial”. What was and is the position of the municipality of Yvoir regarding the annual commemorations in Spontin? Actually it seems that it is not really a topic where the municipality showed and shows proactive interest, but more a passive-reactive attitude. “The municipality is only reacting when it is contacted”, explained Patrick Evrard regarding the commemoration which took place in 2016. For the big 2014-commemoration in Spontin in the framework of the Centenary, the municipality of Yvoir had been more actively involved. But also for the Centenary the Municipality hat not issued big declarations, and “nothing had been discussed in the Municipal Assembly”, neither the organization of the Centenary nor the decision not to continue after 2014. Patrick Evrard is member of the Municipal Assembly of Yvoir, but not of the Collège Communal, which is the executive branch of the Municipality (with the mayor at its head). It was the Collège Communalwhich was involved in the organization of the Centenary, and not the Municipal Assembly. “Concerning the question not to continue, if there has been a decision on the level of municipality, it must have been taken within the Collège Communal. But there have been no deliberations about this question”, as can be seen in the publicly accessible minutes of the sessions of the Collège Communal where this question is not mentioned. Patrick Evrard added that it had been important that the idea not to continue was supported by Jean Germain “a notable from Spontin”, and the priest Bernard van Vynckt, “a strong personality”: They are “two respected personalities, and this gave a certain legitimacy to the step.” What does Patrick Evrard think about the decision? “I think it was the right thing to do. At one point you have to stop. But this does not mean to erase the memory. There are other forms of transmission. Schools are important.” As another illustration, Patrick Evrard then evoked the project initiated by the association of Jean Germain to put, in fall 2017, at several places of the villages information signs about the history of Spontin, and in which the events from 1914 will of course also be evoked. My conversation with Patrick Evrard helped me to clarify certain points: The commemoration of 2016 had been an individual initiative from a local inhabitant, not one of the municipality of Yvoir. Which all together did not to seem very proactive. But the question remained to what extent and in which way the municipality of Yvoir had been involved in the decision-making-process to stop the commemorations after 2014. As Patrick Evrard is not member of the executive arm of the municipality, he could not really tell me. This conversation also raised my curiosity towards Léo Couturier, this elder inhabitant who had initiated the 2016-commemoration: What had motivated him, what was his point of view on all this matter? When I asked him who had taken the decision not to continue, he gave me an answer I had already heard from others: “I don’t know.” Later he said “They have talked about it, but they have not decided”, without specifying who he meant by “they”. I was again getting confused, increasingly caught by the irritating impression that at the same time there had been a decision, and that there had been no decision. And the question of the role of the municipality of Yvoir in this matter still remained unresolved. Back in Sarajevo, I wrote directly to the current mayor of Yvoir, Etienne Defresne, who happened to also be the municipal delegate in charge of patriotic ceremonies at the moment of the Centenary, and in that capacity had also been on the 2014-organisation committee. He then became mayor in 2015. I sent him a long email, with seven questions, related to the decision of 2014, to the continuation of the ceremony in 2016, and to the role of the municipality in these activities. Probably too many questions. As I didn’t get an answer also after a second email, I forwarded my email to Bertrand Custinne, who is now the municipal delegate in charge of patriotic ceremonies and who had been present at the 2016-commemoration. I was already wondering if the municipality did not want to answer me because I mentioned in my email that I had spoken with Patrick Evrard, who is not a random member of the Municipal Assembly, but – as I had found out through internet-research – the leader of the opposition party, who had been candidate against the former mayor in 2012, and is foreseen to run against the current mayor in the next elections scheduled for Fall 2018. 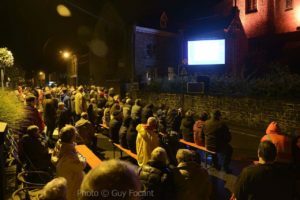 While waiting for the answer of the municipality, the next surprise arrived in September 2017: Patrick Evrard sent me an article from the local newspaper L’avenirshowing that also this year an annual commemoration had taken place in Spontin. So 2016 was not a one-shot, but the commemoration was also organized the year after. And this time even the mayor of Yvoir was present, together with two other delegates. Now what did this mean? I started to think that my emails to the mayor and the delegate for patriotic ceremonies might have something to do with it, that they had perhaps raised some bad conscience within the city-government, with the fear that they might be accused of abandoning a tradition, and that now the municipality had taken over the commemoration, in order to demonstrate the contrary. I called Léo Couturier to learn more about this 2017-commemoration. He told me that this time it was not him who initiated the event. He learned about it through a poster on the entry door of the church. But it was also not the municipality who had initiated it (so much for the idea of my impact), but the two brothers of the Willems-family he had already cooperated with the year before, and who had taken this year the initiative to talk about it with the priest. Then, as in the year before, Léo Couturier informed the mayor, who this time decided to come by himself, and also again the journalist of the local newspaper from Yvoir, hence the article. As the year before, there was first a mass, and then they went to the monument to the dead, where the delegate made a speech. Bertrand Custinne’s answer confirmed that the municipality is in no way instigator of the continuing annual commemorations in Spontin. And he confirmed that there had obviously been a decision to stop the annual commemorations after 2014, about which he heard for the first time only the day of the commemoration. But his answer did not clarify who had been involved in the decision and also raised new questions: How did he learn about it during the ceremony – in a private conversation, or through a public announcement? After these various exchanges and conversations, I was, more than ever, full of doubts and questions: Has there perhaps never been a decision, just an announcement, and then people thought it was a (more or less) official decision? Or had there been a decision but no public announcement of it, perhaps just an informal communication about it? Or neither a decision nor an announcement? Can there be a decision without persons who have taken such a decision? To attain clarity, I decided that the best thing to do was to talk again with Jean Germain. He was the first person I had talked to, he had been the key person regarding the organization of the Centenary, he of all persons certainly knows the best the topic. I called him by phone from Sarajevo and told him what I had found out until now, the different steps and surprises of my research, and also what remained or became unclear to me. Jean Germain answered by providing me additional explanations and specifications, and it turned out that this new conversation with Jean Germain was indeed the right thing to do – with his explanations the puzzle-pieces came together. I remember that when I hang up, I felt on the one hand satisfied, because I had the impression that I had gained clarity, and on the other hand also a bit disappointed, because there seemed to be no mystery left. Probably I would have liked that there would remain a bit of mystery. Actually, the decision not to continue with the annual commemorations in Spontin can be seen as informal in two ways. First, informal in the way that it was made outside of official municipality-circuits, within an informal local organization-committee. And second, informal in process through which the decision was taken in this committee: There was no vote. Jean Germain proposed at one moment to stop with the commemorations after 2014, and there was no opposition to his proposal. “Perhaps some people were against it, but they didn’t say anything.” And so the proposal was considered as adopted. Maybe decisionis indeed even a too strong word at the end. In his second email to me, Bertrand Custinne, who was not involved in the matter in 2014, but obviously knows about it, uses the following terms: il avait été ‘convenu’ au sein du comité de préparation –which can be translated, “it had been ‘agreed’ within the preparation committee” not to continue with the annual commemorations after 2014. “To informally agree” would be probably an even more precise translation of the verb convenir,especially in this context. And what about the announcement of this “decision”? Did the information just circulate informally, or was it actually publicly announced at one moment, otherwise than through the foreword of Jean Germain’s book? If he remembers correctly, answers Jean Germain, he talked about it in one speech during the 2014-commemorations. I ask him if he can send me this speech, so that I can see exactly how he announced it, and one day later I receive the text. 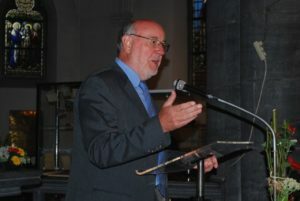 In his accompanying email he explains that he held this speech at the opening of the commemorations on August 22nd, 2014, in the church, this emblematic place which had been destroyed 100 years before, and where were now inaugurated the Centenary-commemorations with the vernissage of an exhibition about the events of 1914. It was therefore an important speech, the one opening the 2014-commemorations and setting the tone for them, and held in front of a packed church, among them the mayor of Yvoir and other officials, as I could see on photos of this event. In this speech, Jean Germain explained to the audience the meaning of these 2014-commemorations, how he and others had prepared the different activities, and announced the steps of the program. It is a moving text, because Jean Germain uses a personal tone in this speech, full of respect for the victims of 2014 and their memory, and at the same time not without humour, which is not at all in contradiction with this respect. “Speaking of these victims, grandparents or great-grandparents, it is reassuring to know that, according to Christian tradition, at least that of my childhood, the dead and the disappeared continue to look down on us from above, as on their balconies, to observe us, a little like the angels lying on Michelangelo’s clouds. What had I expected? That there would be a sort of “And we decided that there will be no commemoration anymore!”-declaration? Yes, the idea not to continue was announced publicly, but it was not a loud announcement, it was done in a very discreet way, one could say in French: en passant (“by the way”). And why should it have been differently? This Centenary was about recalling the memory of the events of 1914 and of honoring the memory of the dead, and not about the question whether to continue or not the annual commemorations. I hadn’t asked Jean Germain what motivated him to announce the decision in this way, because during our phone conversation I didn’t know his speech yet; but from what he said at other moments of our conversation, I would think that there might be some additional reasons why he didn’t emphasize it more—perhaps because he estimated that it was anyway known (“People knew”), and/or because it was a decision which seemed logical to him (“It fell under common sense”), and/or because of the nature of the decision (“It was not an official decision”). Perhaps another reason was that he sensed that this was a sensitive topic, with which perhaps not everybody was happy and which also could easily lead to misinterpretations and misunderstandings. Anyway, the aim of this announcement was also not to criticize the annual commemorations which had been taking place for so long. On the contrary, the tradition was praised, and the idea was also not to say “enough is enough”, but the speech was explicitly combined with an invitation to continue to remember the victims. This is also why I think it is important to quote here the entire paragraph from the speech – and from the preface of the book – and not just the phrase about the stopping, because it puts it in its context, and illustrates strongly that this decision is not about erasing the memory but to find other ways to keep the memory alive. So the decision not to continue had indeed been publicly articulated only through this one sentence from the foreword of the book “Spontin, blood and fire”, a fictive text written by Jean Germain from the perspective of those killed in 1914, and which was once read out loudly in the framework of the Centenary. All together, this way of announcing fitted perfectly the entire decision-making process: it was between explicit and implicit, more informal than formal, and did not actually make clear who made the decision, as this decision was communicated through the dead who had been made alive again. I see it as a rather elegant solution to deal with the matter. The way it was decided, and the very discreet way it was publicly announced, also makes it much clearer as to why so many people couldn’t tell who had actually made this decision, and why some people were not even aware of it. Besides the bilateral consultations Jean Germain had had with friends and colleagues, there had been no public debate on the matter. As we have seen, also within the organization committee, there had been no discussion about it after Jean Germain made the proposal. This way of informal decision-making, without real explanation, might also have contributed to the fact that some persons felt not very happy with it. For those who were skeptical, it was probably not easy to express their discomfort as they likely had an impression that there was consensus around it, and also because the focus was on organizing the Centenary and not on its aftermath. On the other hand, if persons had really disagreed with the decision before and in 2014, they could have found means to express it. Now when some people told me that they don’t agree with it – had they already expressed this before? Or did they just express it because I asked them? What is indeed also certain is the following: there was a disagreement which was obviously not articulated in 2014, but later, not by vocally criticizing the decision, but simply by taking the initiative to reactivate the annual commemoration in 2016 and then also 2017, and here also without big announcements or declarations. There are therefore interesting parallels in the way the annual commemoration was stopped and then reactivated. All together, what is striking to me is that this question of stopping the annual commemoration in Spontin was not what we could call a “big deal”. When I started researching this topic, or when you started to read this article, you might have thought that it must have been a sort of “front page”-topic, linked with a big decision and big discussions, that it was all over the place. But it was not. It was more an internal question of the village-community of Spontin, not meant to be a major topic or to become something particular – and certainly not done with the purpose to become the subject of an article. 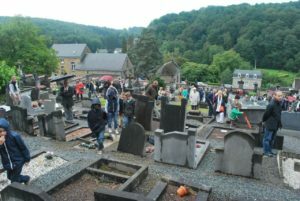 It actually became a bigger deal when the mayor of Dinant, Richard Fournaux, talked about it, by announcing that Dinant would not do it as Spontin and would continue with its annual commemorations after the Centenary: this is how it became known also outside Spontin, especially in Dinant. This is also also how I heard about it. But outside of Spontin and Dinant, probably not many know about this, and why and how should they? It will become now also known for those who will read this text, and I have a bit a bad conscience that I take this “not-a-big-deal”-story from its local context and put it on a more public plate. But on the other hand: commemorations are a public matter, and even if what happened in Spontin regarding the annual commemoration was not a spectacular story, this does not mean that is is unsignificant issue. It was and is a question which matters to different persons within the village community, and it is definitely a topic which deserves also more general attention, because the case of Spontin allows to raise, in a thought-provoking way, universal questions: Under which circumstances does it make sense to stop or to continue the tradition of commemorations? What are appropriate means to keep alive the memory of certain events? Who is legitimate to decide about such matters? Whydo we want to remember? The new conversation with Jean Germain and also the lecture of his speech makes me also aware about something else: How remarkable and far from self-evident it is that this tradition of the annual commemoration was upheld for one hundred years. When in my last phone-conversation I told him that this decision to stop the annual commemorations seemed quite unusual to me and asked him whether he knew other examples where a community had decided to stop, Jean Germain misunderstood my question, on purpose or not, and answered that yes, he doesn’t know other villages in Belgium which have held annual commemorations for so long. It is true that some towns have also continued, year after year, to organize an annual commemoration of the massacre they experienced in 1914, as Dinant or Andennes. But these are towns which are administrating themselves, with municipal resources and manpower which can take care of such commemorations. In Spontin, the annual commemoration continued despite the fact that after 1976 it was not anymore a municipality by its own with its own direct municipal structures. At the end, in this entire question of keeping-up (or not) the tradition of annual commemoration, there are actually three things which are remarkable about Spontin: that the tradition of annual commemoration was upheld for one hundred years; that in connection with the 100th anniversary a decision was taken not to continue with this kind of commemoration after 2014; and that nevertheless, the tradition of annual commemoration has been revived in 2016 and continued in 2017. What is common to these three processes is that there is an obvious dialectic between them: After nearly one century, in the years before 2014, the annual commemoration had widely become a routine, it took place more as an automatic repetition rather than out of a genuine commitment – what led to the decision proposed by Jean Germain not to organize it anymore. In 2015, the annual commemoration had basically disappeared. Its deliberate disappearance then inspired some to rediscover its meaning and to become proactive: Léo Couturier and others had been motivated by the stop to take the initiative to organize the commemoration in 2016 and 2017. The act of stopping therefore had led to new commitment, or, in other words: the decision to stop has given new life to a ritual which had been at the end of its rope. What is also common to these three processes is that they all took place on the level of the “village community”, mainly outside of municipal decision-circuits. It shows not only the importance of informal decision-making-channels and processes, but also the importance of local stakeholders and individuals, as Jean Germain for the organisation of the Centenary and for the stop-decision, or Léo Couturier in order to revive the tradition. But all of them were and are not acting alone. 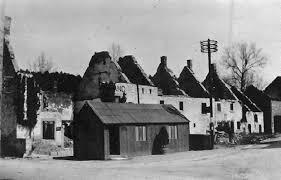 These processes also illustrate, not surprisingly, division lines within this small village community, and also different approaches towards memory: one which is insisting on the importance of ritualized forms of remembrance, another which wants to go beyond and develop other approaches. My personal sympathy would go more towards the latter. But I also fully understand the need of Léo Couturier for more ritualized events, and find also his commitment remarkable. And there is something else what is remarkable regarding Spontin: it is the Centenary itself, and the fact that such a little village organized such a strong and vivid event. Together with his speech, Jean Germain sent me also a dropbox-link through which I could access a series of approximately 200 photos which had been taken by different persons during the Centenary. Up until this point I had read articles about or speeches made during the 2014-event, and seen some individual photos. But going now through so many photos, about so many different activities which had taken place during these two and half days, with so many persons from all generations participating (including some faces I recognized because I had met them in the meantime through my research), not only made the event less abstract and much more concrete to me, it also made me aware what an important and comprehensive event this two-and-half-days-commemoration must have been in Spontin. The commemorations of the Centenary of the massacre in Spontin, 22-23-24 August 2014. On the left, Françoise and Jean Germain, in the middle Ovide Monin (together with the military attaché of the German Embassy in Belgium), and on the right Etienne Defresne (with the yellow sash). © Guy Focant. The commemorations of the Centenary of the massacre in Spontin, 22-23-24 August 2014. Upper photo: Activity with school children in the cemetery of Spontin. © Hugues Saudemont. Bottom photo: Sound and light-show in front of the church of Spontin. © Guy Focant. After all, “Enough is enough” is definitely not the good summary for what I have found in Spontin. Firstly, because the proposal and the decision to stop the annual commemoration was not motivated by such an opinion, and, secondly, because the commemoration continues anyway. I nevertheless decide to keep “Enough is enough” in the title. Because this is not only a text about what happened in Spontin, but also a reflection about my expectations and my research. And also because it is a catchy title. And who said that a title always needs to perfectly summarize or reflect the content of the article? I also know that it might be misunderstood, and that in Germany there are currently (again) right-wing attacks against Holocaust-remembrance, arguing that one should put an end to “this cult of guilt”. But, the context is not at all the same, and do I anyway always have to take into consideration what is going on in Germany when formulating a title, especially when the content is not specifically about Germany? And where has this exploration of Spontin taken me regarding my own research interests? Of course, this text will also not be my last memory-related-article, as I thought it could be. This research about Spontin stimulated my appetite. In general, I would like to work more on this question of stopping official commemorations outside of political regime-change. During my research in Spontin, I remembered that in France, in 1975, the President Valery Giscard d’Estaing had decided to suppress the 8th of May – related to the end of the Second World War – as an official holiday, and that his successor Francois Mitterrand had restored it after his election in 1981. I have now started to dig more into this 8th May story in France, with the idea to make a scientific article out of it, in order to better contextualize and understand (both) decisions, from 1975 and 1981. It seems that for the moment I still don’t have enough regarding memory-related topics. Perhaps one day I will. Also regarding Spontin, my research stimulated more interest. It would be worth to check the local archives to research in depth the practice of the annual commemorations until 1976, when Spontin was stripped of its municipal autonomy and integrated in the municipality of Yvoir, and then how this transition did (not) affect the tradition of the annual commemorations. I have already a nice title in mind for such a text: “Tradition and transition” – which could also be used as a title for a more general book about how commemorations are living through of political transition-processes. Also the Spontin-2014-Centenary itself would be worthwhile to analyze in more detail, including the question of what impact it had on those who participated. But this additional research is not realistic for now. Unfortunately, the list of texts I would like to write and which I will probably never write is becoming longer and longer, and is growing much faster than the list of the texts I actually did write and publish. Also regarding the main topic of this text – to continue or not to continue with the annual commemorations in Spontin – I still have some appetite left. I am curious to ask even more people for their thoughts. For example, the journalist who wrote the articles in 2016 and 2017: To what extent has he heard about the “decision” to stop the commemorations? The new priest, who succeeded in 2016 to Bernard van Vynckt: What is more exactly his role in the “new” commemorations, how does he see the matter? Or to follow up again with Etienne Defresne, the former delegate and current mayor of Yvoir, who ignored several of my emails. But actually I won’t do it. One reason is that I fear a bit that if I am continuing to ask more persons about the topic, I will contribute to make the entire issue bigger as it actually was and is. Who knows, perhaps the journalist will then publish an article about this “decision” – and then it might become a trigger of mutual accusations, especially because 2018 is a year of electoral campaign – just because I continued to ask. At one moment, during our last phone conversation, I asked Jean Germain if he heard any reactions from others about my research. He answered that people I interviewed mentioned it sometimes to him, but that there was no reaction like “He should mind his own business”. Again, so much about my impact. But who knows what would happen if I am pushing further? The question to what extent a researcher is influencing the topic he/she is working on is a crucial issue which would be worth exploring much more in memory-studies (including the question of to what extent researchers over- or underestimate the impact their work has on the local community they are working on). More importantly, I have the impression that with my last conversation with Jean Germain, I gathered the most relevant information I was (not) looking for, that therefore I have come “full circle” with my research. Of course I could always find out more. But if I want one day to publish this text I also can’t go forever with researching. At one moment you have to stop and to write. And to stop to write. Enough is enough. I would like to thank all persons mentioned in the article who were willing to talk to me during my research. Furthermore, I would like to thank Marie E. Berry for the thorough proofreading of my text, as well as Valérie Rosoux, Wulf Kansteiner, Gruia Badescu and Vjeran Pavlaković for their stimulating comments.